Oh my god. I mean just... oh my god. 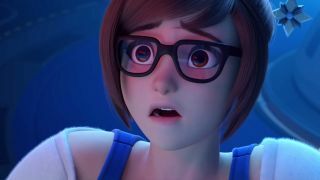 It turns out that Mei, Overwatch's most adorable scientist with a freeze ray, has quite the heartbreaking origin. A new animated short released at Gamescom 2017 shows the plucky genius at an Antarctic research station, explaining that an intense blizzard has kept the crew on lockdown and low on supplies. Mei doesn't seem too bothered though, as the leader of the expedition has ordered everyone into cryosleep. From there, things get... well, you read the first three words of this post. Set aside 10 minutes and have a watch. You may be wondering what Mei is doing in Antarctica in the first place. Overwatch keeps its lore mostly out-of-game, but along with the robotic uprising known as the Omnic Crisis, the Earth in Overwatch's universe was undergoing drastic climate change. Overwatch (the organization) established multiple bases around the globe to study the phenomena, including Ecopoint: Antarctica. So when Mei talks about collecting data, it's data on weather and climate. And don't worry, according to a lore-building blog post called "Mei's Adventures," she made it back to civilization just fine. As for the video, personally, I'm pretty proud of myself. Managed to watch that and only cried twice. What is it about adorable robot companions and the sacrifices they make that pierces my ice cold heart?? I also like that there seem to be references to both Warcraft (the murlock coffee mug) and classic horror film The Thing (an American named MacReady stationed at the base). Overwatch videos tend to be packed with little details and Easter eggs, so tell me what you noticed in the comments.